Summertime is wildfire season. 2013 has already been “steady busy,” and has brought several large blazes, including the fatal fire in Colorado’s Black Forest, where two people died and over 500 homes burned. Most departments in the US require their firefighters to train in wildland firefighting; the basic course is taken to earn your “Red Card.” For this reason, almost every fire department, paid and volunteer, has personnel who know how to respond and contain these non-structure blazes. There are times, however, when local resources cannot adequately manage the incident, and mutual aid is required to protect lives and property. Mutual aid may include other local fire departments; law enforcement; and other nearby agencies tasked with fighting the fire, evacuating residents, managing traffic in and out of the incident area, and managing the overall personnel and logistics. When analysis determines that the incident is overwhelming local resources, the National Multi-Agency Coordinating Group (NMAC) is available to provide additional resources and expertise to the geographic areas. In addition, NIFC houses the National Wildlife Coordinating Group, chartered to help the fire agencies. The NWCG charter tasks the agency to “develop and maintain standards, guidelines, training, and certification in interagency wildland fire operations.” Interagency guides for policies, including Aviation support and Hot Shot crews, are available here. 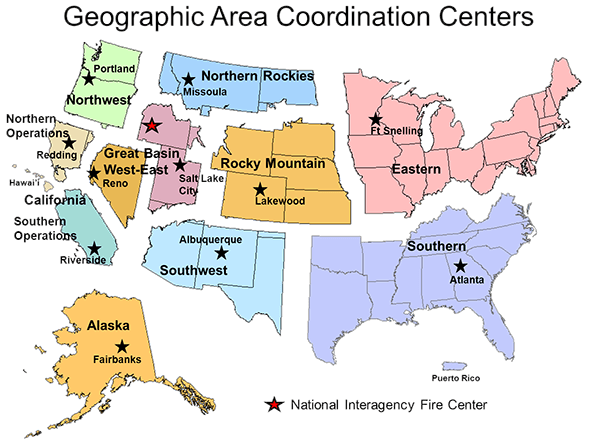 The NMAC maintains eleven regional Coordinating Centers where resources are dispatched to support local firefighting efforts. Specialists in Incident Command, Logistics, Communications, and other roles are dispatched to assist local agencies. At the bottom of this page you'll find the map showing the geographic areas, and a data list that gives the contact information for the geographic area supporting your state. Click here to go there. Requesting additional help is a decision made by the local agencies involved in the incident, and must consider local resources available, the size of the scene, and accurate fire behavior predictions. It is always a good idea to understand your local resources available if a wildland fire occurs. What are the historical fire dangers within your jurisdiction? Having a written plan and local agreements with other agencies is critical. Training exercises with other agencies including fire, police, EMS, and others will build relationships. It will also help to pre-plan communication challenges, the realistic availability of personnel and equipment resources, and practicing with a joint incident command structure. The regional Coordinating Centers can provide assistance and guidance in determining which regional resources are required, be they a full strike team of engines or aviation resources, but a local understanding of available resources will make it easier to dispatch and manage an interagency response. On the ground, interagency communications can be a challenge. Radio Frequencies are assigned locally, and those frequencies must support other calls and responses outside the mutual aid incident. At the local level, many departments have an “incident command” or TAC channel available to put all responders on the same frequency, but not all of them do. When mutual aid from geographic areas or NMAC is required, the responders utilize the local frequencies assigned to the extent possible. There are regional and national frequencies available for larger incidents through the NIFC Radio Cache. • The NIFC Radio Cache is the largest in the world consisting of 8,000 handheld radios, 200 repeaters, and 15 portable satellite systems. • This equipment can support about 32,000 firefighters or 53 major disasters at one time. • Every year, the Radio Cache sends out kits to fires across the country. Communications Techs will work to coordinate for and deconflict any communication needs. These techs are assigned from the National Interagency Incident Communications Division (NIICD) and can manage portable communications to free up local frequencies to permit agencies not involved with the fire to continue to respond to other local calls. Most state and local wildland training and qualification standards mirror those of the NWCG, and federal agencies agree to honor each other’s standards. This is critical when mutual aid is required. In addition to the Red Card, Mr. Kaage suggests department personnel take the ICS-100 incident command course at the minimum, as “everybody follows the IC system used across the country for hazard response.” NWCG offers training in Wildfire Suppression and Management locally, regionally and nationally through Geographic Training Representatives. Click here for courses and more information. Safety is the first priority of all firefighting, and departments train to ensure everyone comes home. For local departments, Mr. Kaage recommends a refresher at least once a year on the basics. Reviewing S-130 Wildland Firefighter Training, and S-190 Wildland Fire Behavior will help ensure that your personnel have the training and knowledge to help keep them safe during wildland season. Firefighters should take courses to prepare themselves individually to be safe and ready to respond to wildland blazes. For those who may be interested in applying for either seasonal or permanent job as a firefighter with NIFC, please visit http://www.usajobs.gov.